Yesterday, a resolution was adopted in the UN Human Rights Council that will begin the process of elaborating an international legally binding instrument on business and human rights. Despite strong opposition from the EU and US, the resolution received affirmative votes from 20 member States on the Human Rights Council, while 13 States abstained. This victory in the promotion of human rights is welcomed by the Treaty Alliance, a group of networks and campaign organizations collectively working to organize advocacy in support of developing binding international regulation to address corporate human rights abuses. A statement calling for an international legally binding instrument has been signed by 610 civil society organizations and social movements and 400 individuals from 95 countries. Additionally, the Subcommittee on Human Rights of the European Parliament and the Vatican have made statements supporting the creation of such an instrument. 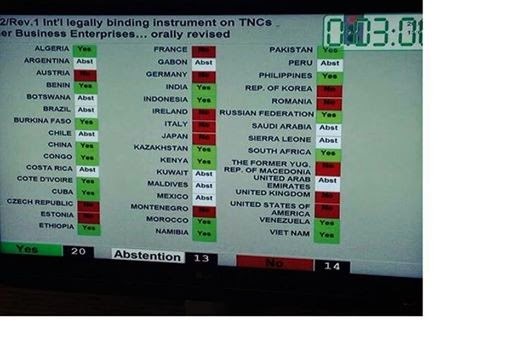 compromise, but were not willing to provide a concrete path towards the drafting of a binding instrument to prevent human rights abuses by TNCs and other business enterprises and allow for the provision of remedy to victims. While companies have a responsibility to respect all human rights, as reaffirmed in the UN Guiding Principles on Business and Human Rights, they are currently not held legally accountable. Thus, the implementation of the Guiding Principles at the national level has been slow and the Guiding Principles remain insufficient to prevent human rights violations. In the meantime, many victims around the world continue to suffer without access to justice. Members of the Treaty Alliance emphasize that the establishment of a binding instrument is complementary to the implementation of the Guiding Principles and necessary to ensure glaring gaps in protection are addressed. Notably, an intergovernmental process will also contribute to addressing current imbalances under international law, particularly in light of protections companies can obtain under Bilateral Investment Treaties and Free Trade Agreements, which have allowed corporations to sue States. While the US and EU have repeatedly stated that they will not participate in the intergovernmental open-ended working group established by the resolution, the Treaty Alliance hopes for their involvement in this process that will be critical to ensuring effective protection of human rights in the context of business activities.